The following ECG was sent to me recently. It’s a great case and a situation that we can all be faced with. The question is: Is this VT or SVT with Aberrancy? The further question is; What do you do when your treatment isn’t working? The patient was given escalating doses of adenosine 6,12 and later 18mg with no effect. He was sedated and cardioverted at 100/200/200J, with no resolution. Some people said “wake the patient up and see what happens as long as they are stable”. Good option. Most people said “consult cardiology”. Some said lignocaine and some said start an amiodarone infusion. An Amiodarone Infusion was in fact commenced. Soon after this, the patient’s rhythm deteriorated into Ventricular Fibrillation and then Asystole. CPR was commenced and Adrenaline given. There was ROSC and the patient regained consciousness. The question was asked about possible alternative diagnoses of the ECG. Not about the management- which should be sedate and cardiovert immediately(more on this later). Here is a graph of the percentage of people who thought it was one of five diagnoses. We see that most people thought it was VT, however a substantial number thought it was SVT associated with an accessory pathway of WPW. Let’s have a look at the 3 alternatives. Let’s remove HyperK and Na channel Block as it was not either of these. This usually means SVT with a bundle branch block. You will see that the morphology is quite different to the ECG above. The ECG below shows a LBBB morphology with a rapid rate. However, the QRS is not very wide at all. This is SVT with a LBBB. A substantial number of people thought it was an SVT with antidromic conduction via aWPW-like accessory pathway. This was mostly because of the rate itself. In some cases it was very fast approaching 250bpm. This is in fact quite fast and I agree that if the rate is greater that 250 think of an accessory pathway. 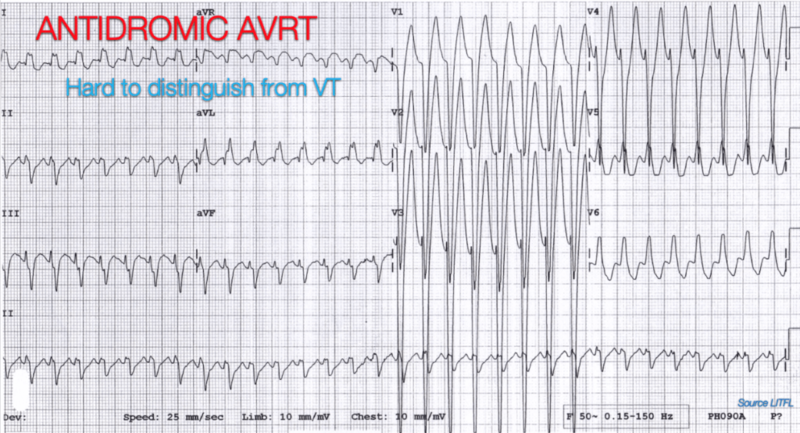 A rhythm like AV Nodal Re-entry Tachycardia will be almost impossible to differentiate from VT. It can run at a very fast rate. If yes to both it is VT. Compare this to the more academic approach to making the diagnosis. For a more academic approach to ruling in VT, there are certain criteria to look for. 3. Are there p waves and is there true AV dissociation? 4. Are there capture or fusion beats? 5. Is the axis extreme? 7. Is there RSr pattern? 8. Are any of the signs present? The first thing I can see in this ECG is AV Dissociation and the second is Josephson’s Sign. Irrespective of the rate, it is VT. I discussed this with cardiology and the cardiologist agreed that it was VT and agreed that it may have been too long a period in VT for this patient. The question of what to do if cardioversion isn’t working on these patients needs to be addressed. There aren’t a lot of options. We can wake the patient if they are haemodynamically stable and then regroup with cardiology. We can give amiodarone and then try cardioversion . An alternative is to try and use two defibrillators. This is OKAY as long as you can deliver the current within a couple seconds of each other. A further option is to use overdrive pacing. Would you use something different? The message is that we have to make it simpler on ourselves. We need failsafe approaches that we can use at the resus cubicle bedside. I talk about the failsafe, or as someone else called them “The 2am in the morning, when my brain isn’t working” approaches to the hardest cardiology problems at the Cardiac Bootcamp and am delighted when I hear the stories coming back of where people had to use them. Non-Sustained Ventricular Tachycardia; What Would You Do?